Founded in Pittsburgh, PA, in 1991, PowerLink is a unique and proven resource for advancing women-owned businesses. PowerLink advisors are business professionals who volunteer their time and expertise for two years. PowerLink Aadvisory board meetings are held quarterly and are facilitated by a professional board manager who works closely with the business owner to ensure successful outcomes. 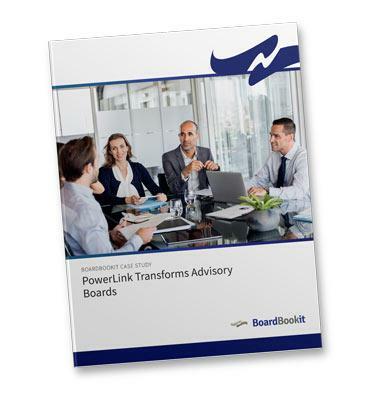 This Case Study explores the positive transformation the BoardBookit board portal software had with Lee Ann Munger, the PowerLink Advisory Boards Executive Director. Read about PowerLink’s success story in this BoardBookit Case Study. Reduce labor, printing, and mailing costs by eliminating manual board administration tasks. BoardBookit customers report up to a 200% ROI! Our customer care and support staff is standing by to answer any questions or help in any way. Enterprise customers enjoy 24/7 support 365 days a year.